Will the Centre bail out debt-stressed Punjab? Parkash Singh Badal has met Narendra Modi and Arun Jaitley with a long list of economic, political and religious demands. Common sense says one should take up one or two issues at a time, explain them simply and logically to convince the listener of their merit. Fire safety gets short shrift in India. Not a day goes by without a report of a fire, and unfortunately in too many cases, there is loss of lives and property. Even modern cities do not fare well enough. A fire gutted shops and a hotel in Pahalgam. Everybody in Punjab has a drug story to tell. It is a poignant tale of addiction, human misery and lack of consensus on the need to develop a humane approach to a complex and multi-dimensional problem. An encouraging corollary of the media spotlight has been the 'visibility factor' which has generated a great amount of debate and discussion on ways and means to deal with it. Undoubtedly, Punjab is facing a crisis. After paying hefty amounts at corporate hospitals for routine eye check-ups, I was pleasantly surprised when the lady at the reception handed me a receipt of fifty rupees. Fifty rupees! That’s it? I wondered whether the doctor's ability was directly proportional to the amount of fee he charged. I was honestly, a little skeptical. Peaceful, serene, spiritual, sublime...these are some of the adjectives used to describe the Golden Temple in Amritsar. When devotees go there, they do so with a prayer on their lips and humility in their hearts. Harmandar Sahib or the House of God, is where human egos should have no place. Parkash Singh Badal has met Narendra Modi and Arun Jaitley with a long list of economic, political and religious demands. Common sense says one should take up one or two issues at a time, explain them simply and logically to convince the listener of their merit. Modi is still trying to understand how the system works and it is too early for him to apply his mind to complicated state issues. Besides, Modi likes corporate-style presentations which, of course, cannot be expected from Badal at his age. Jaitley is busy with budget preparations and defence matters. Since the Shiromani Akali Dal is an old and reliable ally, both BJP leaders gave the Punjab Chief Minister a patient hearing. The outcome, however, may not be what Badal has in mind. It was not the right time for Badal to open a Pandora's box with the demand for the transfer of Chandigarh and other Punjabi-speaking areas. The river waters issue is pending in the Supreme Court. Since Haryana is going to the polls later this year, the BJP leadership will not like to spoil the party's chances of electoral success by even looking sympathetic to the Punjab CM's controversial demands. Only tripartite talks involving leaders of Punjab, Haryana and the Centre held in a give-and-take spirit can, perhaps, sort out these contentious issues. Again, due to electoral compulsions, the BJP leadership will not commit to an amendment to the Sikh Gurdwara Act, 1925, to help the SGPC take control of gurdwaras in Haryana and elsewhere. The real issue which Badal should have focused on was an economic package for Punjab to accelerate its sagging growth. Badal has sought a Rs 1 lakh crore loan waiver. Punjab's staggering debt could have been halved had Badal backed Manpreet Singh Badal, who as the then Finance Minister was negotiating with the Centre and was reportedly close to success. The Centre was open to the idea of helping the three most debt-stressed states of Punjab, West Bengal and Kerala. Only time will tell whether Badal succeeds in his dealings with a friendly government at the Centre. Fire safety gets short shrift in India. Not a day goes by without a report of a fire, and unfortunately in too many cases, there is loss of lives and property. Even modern cities do not fare well enough. A fire gutted shops and a hotel in Pahalgam. Another fire led to the collapse of a multi-storied building in Chandigarh. Two firemen lost their lives in the latter incident. Both cases, in different ways, are an unfortunate reminder of the poor preparedness and response of government agencies to man-made challenges. In a number of cases, the scale of the fire and its potential to cause damage is initially underestimated and the first responders do not receive adequate and timely assistance in tackling the fire. Fire-fighting equipment is later rushed in, and by this time the blaze is often uncontrollable. The fire department has been low on priority for most urban administrators. Over the years, even as police forces have been beefed up and given better equipment, fire departments have been ignored. There is an urgent need to provide modern training and equipment to fire fighters. In order to ensure fire safety, buildings need to be certified as 'safe' by the fire department. Smoke detectors and modern fire-detection systems must be retrofitted, if necessary, in all buildings that are accessible to public. There should be regular checking of various provisions that building owners are required to maintain for fire prevention. Fire drills must be carried out in public spaces and buildings. Special emphasis must be placed on educational institutions, especially schools. The practice of dealing with problems as they arise rather than planning strategically to avoid them is called fire-fighting. We must fight fires by taking measures to avert them by following safe practices and taking preventive measures. At the same time, we must empower our fire departments and give them the ability to fight fires effectively when they are called to do so. AT the annual meeting of the Victoria League in mail week Lord Curzon, the Imperial ex-Viceroy, had a good word to say for India. "When they were considering the question of Empire," his Lordship said, "they must never leave out of sight the question of India, because although India was a dependency, and although it might be long before she became a self-governing Dominion, in numbers and political importance and weight on the destinies of mankind India was perhaps the greatest of the assets of the Empire." This is a testimony which is worth having when even the Times is asking Englishmen to appreciate the overseas' point of view in regard to Asiatic immigration. Lord Curzon's appeal seems to have evidently fallen on deaf years. At any rate he has not succeeded in impressing the Times with the cogency of his remarks. It rest with Indians and with the Government of India to make the requisite impression on the British public. QUITE recently a gallant British soldier appealed in the columns of the Times that every soldier who had served for seven years in the N.W. Frontier stations should be decorated with a special medal in recognition of the risks to which he was exposed. This has brought a crushing reply from another, and the following will be read with great satisfaction by all who had felt disgusted at the vain and unsoldierly craving for drawing-room decorations which the original proposal had suggested: "In my day in India every keen soldier tried to get to the frontier in the hope of seeing service. They never sought medals. They sought danger gladly because that was their trade and they loved it. Everybody in Punjab has a drug story to tell. It is a poignant tale of addiction, human misery and lack of consensus on the need to develop a humane approach to a complex and multi-dimensional problem. An encouraging corollary of the media spotlight has been the 'visibility factor' which has generated a great amount of debate and discussion on ways and means to deal with it. Undoubtedly, Punjab is facing a crisis. The discovery of how damaging the abuse of drugs can be for the individual, society and the nation as a whole is evident in the increase in the number of young drug users. A study conducted by doctors at the Post Graduate Institute of Medical Education and Research (PGIMER) in Chandigarh (2012) for the period 1978-2008 reveals a 31.5 per cent of the youth in the age group of 16-25 years addicted to some drug (1999-2008).This was a 9 percentile up from the figures for 1978-88. Opioid dependence cases, it stated, have also shown an increase from 36.8 per cent in 1978-88 to 53.2 per cent in 1999-2008. The vulnerability of this population to life-threatening infection such as HIV, Hepatitis C and Tuberculosis has increased. Lack of any comparable surveys for the drug users in different states of the country has been a major limitation. Figures and statistics which have been the outcome of surveys and studies should be accepted only after a critical evaluation of the scope, sample size, sampling method as also the variables which formed part of the survey. While the drug problem becomes a political tool, the burgeoning incidence of serious human rights violations with drug users being incarcerated has only served to exacerbate the risk environment. It has resulted in the escalation of violence and health crises without any effect on drug use, production and trafficking which continue an upward trend. India is a signatory to the UN conventions on drugs. As in a majority of countries, the drug problem here is considered as ‘evil’ and the drug user as a 'social deviant.' The stringent penalties contained in the provisions of the NDPS Act, 1985 (as amended in 2001), have only swelled the jail population and what accrued in Kapurthala jail is a grim rejoinder of the ineffectual policy which certainly needs reconsideration. Repressive practices such as forced crop eradication, interdictions and incarcerations and even death penalties have only had a 'balloon effect'. The spillover is evident with escalating seizures of novel and more potent forms of lab-based synthetic and pharmaceutical drugs, shifting modes and routes of supply to cater to the demand to increase in health hazards. What is alarming is the rapid progression in the number of injecting drug users (IDUs).It would hardly be surprising if going by the official figures for the rising number of HIV infections, Punjab soon overtakes Manipur as the state with the highest number of HIV-infected people in the country. Criminalisation of consumption has only increased the stigma and denial of access to basic health services to them, including the substitution treatment for Injecting Drug Users (IDUs). This is a flagrant violation of the basic human right to live with dignity. As long as the fear factor is not obliterated, drug users would continue to evade treatment for fear of being treated as drug offenders and locked up in jails and not as patients meant to be treated at hospitals. A major fallout of the 'narcophobic discourse' has been lack of access to palliative care in many hospitals across the country. The report of a year-long study conducted by the students of the University of British Columbia (2011) had revealed the plight of several patients with terminal illness due to lack of access to morphine for their pain relief. India is the only legal supplier of raw opium in the world. Surprisingly enough, according to an estimate, only 1-2 per cent of the patients who require morphine for pain relief have access to it. While the medical fraternity rues over bureaucratic hurdles and lack of empathy on the part of the government, many patients are forced to undergo an agonising and heart-wrenching pain. This amounts to the violation of the fundamental right to life. However, with India emerging as a major transit and consumption point and in view of its geographical proximity to the Golden Crescent and the Golden Triangle, law enforcement component cannot be overlooked. The situation is compounded by the fact that India is also among the licit opium producers catering to half of the global need for opium-based derivatives for medical use. While an illicit diversion of the licit opium is rampant, states having international boundaries such as Punjab and the North-eastern states have become a haven for drug traffickers. Such and many other unintended negative consequences have followed a pro-prohibition centred approach, which both the Centre and state governments with all their rhetoric of acting 'tough on drugs', has simply failed to perceive. It's time to act 'smart on drugs.' The present policies are clearly ineffective, expensive and disparaging. To argue for stricter controls for supply reduction is addressing just one part of the problem. A medical resource exclusively devoted to treatment, post-treatment care, recovery management and research on drugs and alcohol intoxication is an urgent need of the day. Besides the expansion of treatment and rehabilitation facilities, an upgrade of the existing centres, including the presence of trained medical staff, is crucial. A facility for the frequent training of the medical staff at these centres to be conducted by trained experts is imperative. Besides, the government should ensure regular and strict monitoring of the treatment centres to ensure quality service delivery. Frequent sensitisation programmes on various aspects of the problem, including the policy approach for law enforcement officials, politicians, members of the judiciary, private health practitioners, students, religious leaders, faith communities and civil society organisations is a must so that they can be engaged in a meaningful dialogue and action framework. Above all, a visionary political leadership is central to engage with the issue in a realistic manner and put in place the appropriate apparatus such as would ensure that the drug menace is dealt with in a comprehensive manner rather than in a piecemeal fashion. The doctor smiled and said it was enough. While I was coming out, I saw the main gate of the hospital locked. On seeing me walk towards the locked gate, a lady promptly came and opened the lock for me. I asked her what that was for. She informed me that no patients were allowed after 6 pm. That way the doctor could open and close the hospital on time and attend to each patient unwearyingly. I came out feeling that I had finally met a true doctor, one who wants to serve and not simply become rich. After talking to the friend who had recommended him, I came to know that he's one of the most capable doctors in his field and also famous for charging nominally even for complex procedures. My family has been going to the same place for years now, and on my last visit I ended up having a long chat with the gentleman himself. An Armed Forces Medical College passout, he paid out of the bond with the Army because he knew he was made for bigger things in life. 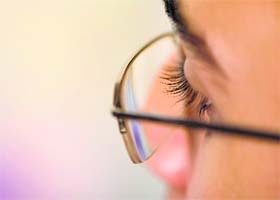 He worked with many prominent hospitals as a corneal transplant specialist, earning a handsome salary and having a stable life, but still knowing that this wasn't something that he was meant to do as a doctor. He wanted to serve people; he wanted to make a difference. But he didn't know how. One day, while working at a famous hospital, a senior doctor asked him to lie to a patient about his condition to squeeze more money out of him. He realised he could take it no longer and decided to quit. One of his colleagues, who had been a silent but equally compassionate listener to his arguments, logics and ideologies, also decided to quit with him. The two of them decided to start a hospital in a rented place in a semi-rural area near Patiala. They had no money and were unable to get a loan sanctioned, but a company was kind enough to lend them basic equipment to start their venture. With infinite zeal and unconditional support of his wife, he established himself in a few years. There were tough times too, but he knew that now he would be truly doing what he was meant to do: Serve people and not do injustice to his profession. Peaceful, serene, spiritual, sublime...these are some of the adjectives used to describe the Golden Temple in Amritsar. When devotees go there, they do so with a prayer on their lips and humility in their hearts. Harmandar Sahib or the House of God, is where human egos should have no place. Every day a Sikh prays to the Almighty to give him the strength to bear the Will of God with equanimity, even as he asks for the wellbeing of all. The visual metaphor dominates much of the discourse of the modern world. So, let’s talk of images. The most common image of the Harmandar Sahib is one of the golden building set between the serene sarovar. At a certain time, it was pictures of armed militants and their leaders posing with their weapons inside the complex. Then came another image, of the scarred Akal Takht building, the result of Operation Blue Star. 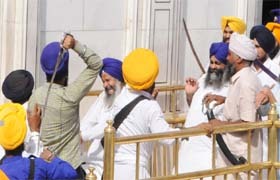 Thirty years later, there was a new one, of Sikhs wielding swords and lathis as a group, said to be of Shiromani Akali Dal (Amritsar) workers, clashed with the Shiromani Gurdwara Parbandhak Committee (SGPC) staff. Swords flashed and ripped the spiritual serenity of the Sikh shrine. Did the individuals who dared to violate the sanctity of the Golden Temple even pause to think of what they were doing? One wonders. The SGPC has been charged with the administration of Harmandar Sahib, and other Sikh gurdwaras since 1920s. Many sacrifices were made by Sikhs to free the gurdwaras from mahants and give access to one and all. The Sikh struggle is a saga of bravery and sacrifice. Let’s look at how gurdwaras were liberated. Historically, various gurdwaras were entrusted to mahants, who were to act as custodians. Over generations, they came to regard the gurdwaras as their personal property and even started following practices that were inimical to the Sikhs. 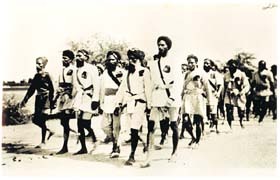 It was in the 1900s that a movement of ordinary Sikhs, provoked by instances of high-handedness at various places, started. As it built up, there were many incidents of confrontation between the Sikhs and the authorities. What stands out is not violence, but the remarkable absence of it as peaceful Sikh protesters took body blows, but did not flinch from their task, and did not raise their hand. This is what gave them and their cause strength. Moral superiority was maintained by purity of purpose, strength of spirit and adopting peaceful means of protest. One of the finest examples of this comes from a gurdwara not too far from Harmandar Sahib. The year was 1922. Groups of Sikhs were protesting against a mahant, Sundar Das, who objected to their collecting firewood from the land which belonged to Guru ka Bagh, a gurdwara. The police and British civil authorities took this to be a property dispute and sided with the mahant. On August 9, 1922, they arrested protesting Sikhs as trespassers. The SGPC sent more jathas and the police became more and more brutal. Rev. Charles Freer Andrews, a friend of Gandhi who also taught philosophy at St. Stephen's College, New Delhi, has given a graphic description of how the Akali demonstrators silently prayed even as the police struck them again and again (see box). Their spirit won them worldwide admiration, especially after Andrews’ account was published abroad. They achieved their purpose when the British authorities finally defused the situation by bringing in Sir Ganga Ram, a wealthy engineer, who on November 17, 1922, acquired on lease the garden land and allowed access to it. Eventually, the British authorities released over 5,000 protesters who had been prisoners. Some photographs of the protest are now in circulation after being digitised and they provide a poignant reminder, in black and white, of the spirit of the people who struggled to free gurdwaras from the control of hereditary keepers and made them available to the public. The resolute look on the face of those who are about to be beaten up and imprisoned is moving. Unfortunately, the recent pictures, in print and on TV show how swords flashed in the air and people were injured in the melee that followed. Where was the restraint? Couldn’t the inheritors of the sacrifice of the protesters of Guru ka Bagh have followed their predecessors? Let the latest incident serve as a trigger for the community to introspect. Looking at the photographs of jathas of Guru ka Bagh protesters marching to court arrests, one remembers the image of their sheathed kirpans, that were not drawn no matter how hard the blows that came their way. They were so strong that they did not resort to violence, did not allow the violence of the other party to move them from the task at hand. The strength of their courage of conviction won the day for them, and immortalised their protest. Gurdwaras should be places where the mind is without fear and the head bowed low before the Almighty. It is where spirituality should reign supreme. On June 6 this year, this did not happen. A real pity. 9.30 am: Mann slips away as his supporters and other radicals get agitated. 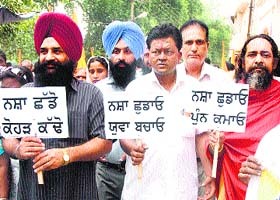 Volunteers on way to court arrest during the Guru ka Bagh morcha. “Close to the entrance there was a reader of the Scriptures who was holding a very large congregation of worshippers silent as they were seated on the ground before him. In another quarter, there were attendants who were preparing the simple evening meal for the Gurdwara guests by grinding the flour between two large stones. There was no sign that the actual beating had just begun and that the sufferers had already endured the shower of blows. “There has been something far greater in this event than a mere dispute about land and property. It has gone far beyond the technical questions of legal possession or distraint. A new heroism, learnt through suffering, has arisen in the land.